What do you do when you are out of cereal (cause we ate it all for dinner) and no one wants oatmeal? You make waffles, of course! Between Heather's waffle craze and Jessica's waffle concoctions...what else is a girl to do? 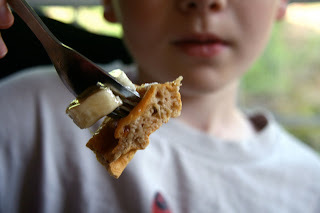 The boys were into the waffle thing before school was out, but got out of it when school was over. My mother-in-law bought us a bunch of Bob's Red Mill supplies when the illustrator found out he has celiac, but she accidentally grabbed a pancake and waffle mix that was whole grain, not gluten free. No worries...we put it to good use on busy mornings! Since we are now out of mix and I can't stop thinking about Jessica's waffle creations, the boys offered me a hand in the kitchen and we got to work! Seriously, making waffles from scratch is just too darn easy! Jay is a plane and simple man! He goes for the maple syrup with a sprinkle of powdered sugar. To each his own, but Max thought this was boring. Max starting working his way around the kitchen. He wanted to know when the bananas "showed up". Seriously, he asked me like they walked up to the front door and rang the door bell! I informed him that I got them from the store the other day. It is too funny how, as a kid, you don't think about how or when things happen. Thinking back though, it would have been more fun to tell him the banana fairy (like the tooth fairy) came to visit last night! I don't think that fast without my coffee, heck who am I foolin', I don't think that fast ever. Max decided he wanted maple syrup, powdered sugar, JKGourmet Gluten Free Nuts and Raisin Granola and fresh bananas. I am with him...this was a perfect combination! I asked the boys which they like better...waffles or pancakes. They told me waffles because all the good stuff gets caught in the holes. I know I am their mom, but my kids aren't dummies...seriously, that is just brilliance! They each wanted me to take a picture of them enjoying their creations. This is Plain Jay enjoying his waffle. This is Maximum Max enjoying his loaded waffle. I changed a few things, but that was just to use what I had around. Mine were doubled to make two huge waffles for us to share. I used 1/2 cup oats, 1/2 cup white wheat flour, 1/2 tsp baking powder (added after mixing everything else), 1/2 cup almond milk, 2 eggs and 1 TBSP flax meal. You should go check out Jessica's version...hers are way prettier too! You know what I am doing to them next time Jessica! Oh and by next time...I mean tomorrow! Oh and HEAB, I am on the hunt for guar gum...I am so doing them a la mode as soon as I get some! Sometimes, cooking with my boys can be a fight between the two of them (everybody wants to add stuff and stir), but this time was so peaceful! I loved it! Are you Plane Jane with waffle toppings or do you go crazy? Aw, you're too sweet! Thanks for the shout-out. I love the question of when the bananas showed up. Too funny! And the good stuff getting caught in the holes. Seriously - kids are too darn smart, because that is so true! And I'm with ya - I wish I was a fast thinker. I always think of witty replies AFTER the fact. darn it! I really am not a fan of waffles (my hubby loves them), but those look good enough to eat!!! Maybe it's the bananas. Sounds like a great way to spend a morning! I made waffles this morning too! Yours look wayyyyy prettier than mine though! Mmmmmmmm, waffles!! 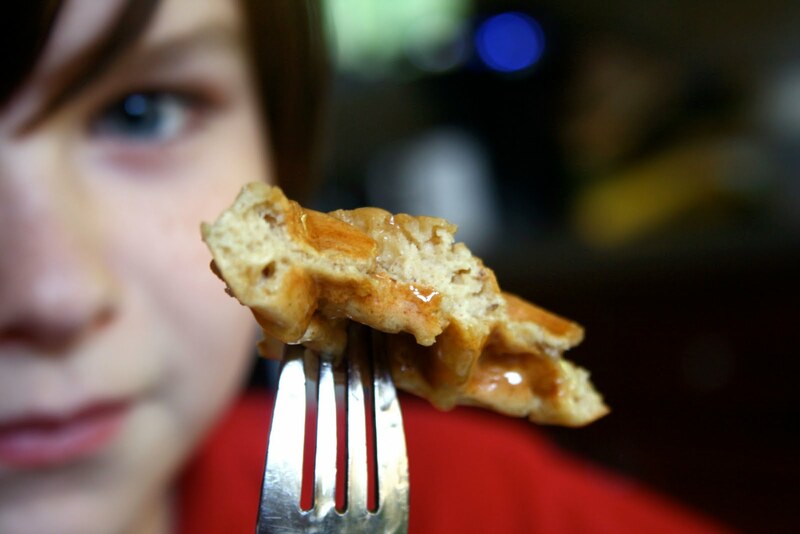 Your waffles definitely beat my daily eggo waffles, hehe!! I really need to get a waffle iron. I'm definitely a plain jane right now. All I want is a little syrup right now. Nothing else. But the pre-preggo Em would have loved some nut butters, walnuts sprinkled on top, chocolate chips, etc. What a great mom you are to cook with your boys and involve them in the kitchen!! I think that is awesome. More moms need to do that!! YUM! I love waffles! I like them plain with just some butter and syrup...ah heaven! Yum!! 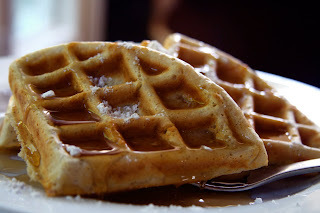 We don't have a waffle iron, but everyone waffle-rific posts lately have gotten me thinking that we definitely NEED one! I'll put anything on mine- love making them not-so-healthy with chocolate chips, coconut, and almond butter. That's gotta be my favorite... with a drizzle of syrup over the top of all of it. Yep... I have to refrain from not eating them all the time, though! Yummy! 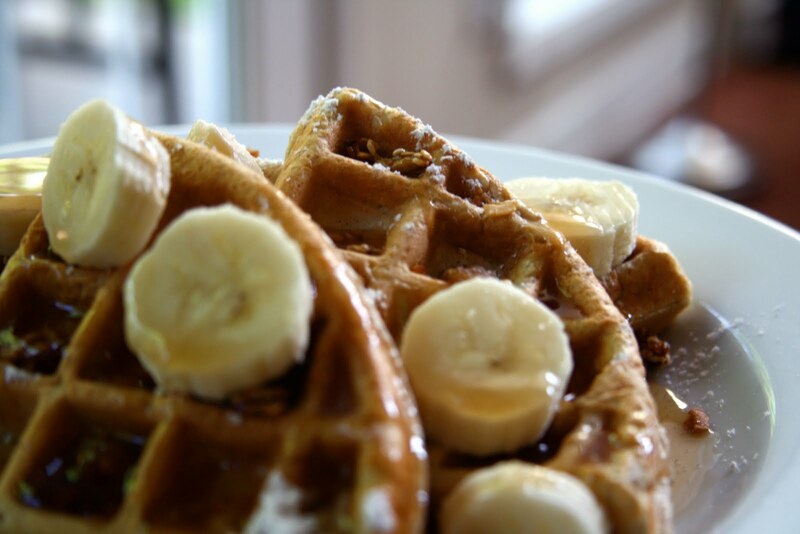 I love waffles..I love adding lots of stuff like maple syrup, maple buter, pb, granola, fresh fruit..yummy! It depends on what I feel like. Sometimes I'm a maple syrup and butter girl, while other times I like melting strawberries in the microwave and top it with that and bananas. granola is a GENIUS addition, I may have to try my next batch MAX style!! haha your boys are right- it's all about the toppings that get caught in the holes! And yes, HEAB's protein ice cream is really good :D Ever since buying guar gum, I've been throwing it into everything to make it thicker. I love it! Those look amazing. Your kids are right about the holes! my favorite thing to put on waffles is peanut butter and jelly. sandwiched together - yum. my favorite waffle toppings? gosh, i don't remember. it's been ages since i had a waffle, i should fix that. i like bananas and maple syrup in the actual batter itself, so on top i'm a plain jane. What a peaceful morning SO cute! Oh those waffles look awesome! And guar gum. Where do you live again? I honestly can't remember! but if you have a WF by you, they have it. or just do iherb.com and order it. ave630 is my code and it will give you $5 off your order, thereby making the guar practically free! I tend to be a plain jane when it comes to waffles, but of butter or marg, loads of maple syrup. 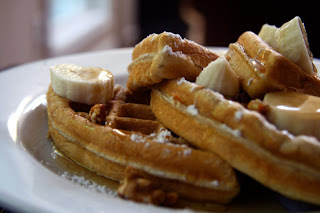 I am especially fond of peanut butter waffles, although I discovered vegan waffles when I got a hold of the PPK and must say that cornbread waffles with mole sauce and veggies is quite awesome too! Haven't had waffles forever, I think I really need some.